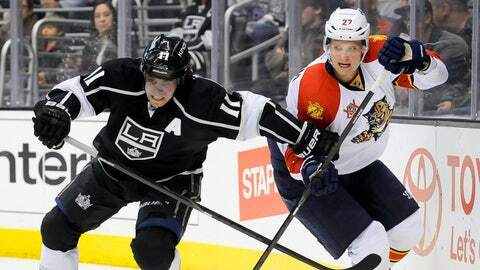 Anze Kopitar, left, is the first member of the Kings to ever be finalist for the Selke. NEW YORK — Anze Kopitar, Patrice Bergeron and Jonathan Toews are finalists for the NHL’s Selke Trophy, awarded to the best defensive forward. The NHL announced the finalists Thursday, who were voted on by members of the Professional Hockey Writers’ Association. Kopitar appeared in all 82 Los Angeles Kings games and had the second-most ice time among forwards behind Pittsburgh’s Sidney Crosby. The Kings allowed a league-low average of 2.05 goals per game. Boston’s Bergeron led the NHL in face-off wins with 1,015 – the most by any player in the past seven seasons. Chicago’s Toews, who won the award last year, placed fifth in the NHL in face-off wins with 884. The winner will be honored June 24 at the NHL Awards in Las Vegas.